First aid kits are packed for the primary purpose of having enough supplies to be able to access and render the proper amount of aid in the event of an emergency. First aid is helping to render immediate attention during an emergency as quickly as possible to help ensure there is no further injury, infection, or damage done to a person that has been injured in an accident. Accidents can affect people at any point, time, or place during a trip. Some needs for a first aid kit are only visible after they begin to appear. Poison ivy for example may take over an hour before symptoms start to show depending on a person's skin type. Being able to recognize an emergency is as important as being able to treat an emergency. Some people may only need lotion to help ease the itching. While other people might begin to show signs of a severe allergic reaction. The first aid kit is one of the most important essentials to bring along during a trip into the back country. Having a properly packed first aid kit can mean the difference between being able to treat a wound or ailment before it becomes worse, and having it become worse as time passes by. It should be a small and compact kit that anyone can use to fix injures they may encounter during a trip. Most outdoor stores sell prepackages first aid kits, but some people also like to add to those or build their own. It's also Important to know how to act in an emergency. Most first aid kits are designed to handle minor emergencies that can easily be fixed with little or no instructions at all. It's also important to make sure that you have good hand hygiene as well. Treating a wound or infection with unsanitary hands could ruin the bandages and make the afflicted area worse. Some of the most common needs for a first aid kit rely on treating poison from plants or bug bites. Having an antihistamine (Benadryl), alcohol pads, along tweezers to pull out a tick or stinger can help prevent an uncomfortable trip from getting even worse if those problems do arise. Pain medications such as ibuprofen for sore muscles, and prescription medications should be kept in a safe place if children are coming along. Bites from animals and snakes can be dangerous if not properly taken care of as soon as possible. Bacterial infections from bites are the most common ailment people suffer from afterwards. Having alcohol pads, water to clean the area of dirt, and bandages to cover it afterwards is necessary. Also, antibiotic cream is a good way to help prevent the infection from spreading over a larger area. A snake bite kit might be needed if venomous snakes are present in the geographic location you are visiting. People who have a history of going into anaphylactic shock may want to take an auto ejector known as an EpiPen along with them. This is a treatment that can be given by injecting the pen into your thigh muscle to help reduce allergic symptoms before they become severe. A secondary option that does not work as fast is an inhaler or antihistamine. No matter which method is used, medical care is still needed as quickly as possible after a person has been subject to anaphylaxis. For those who plan on doing hiking through the woods might want to plan on taking some extra alcohol pads, bandages, along with an ace wrap in case they sprain an ankle or get cut up during the trip. Moleskin is a good way to take care of blisters if a person tends to suffer from them after walking around. It is best to cover the area with a donut shape around the blister instead of popping the area. If it a blister has all ready been popped, it should be washed off and cleaned before a bandage is applied. In an emergency having the proper set-up will give you the ability to treat any injuries, and help ensure survival. Here are some tips for designing a general first aid kit. Building a first aid kit allows you to become accustom to the items inside it and maintain the items for use in case something happens. Distance your group will be from the nearest hospital or medical facility: Type of terrain you'll have to travel over to get to the nearest medical facility as well. Type of environment: Considerations on the terrain, weather extremes, rock slides and other types of events that could potentially happen during a trip. 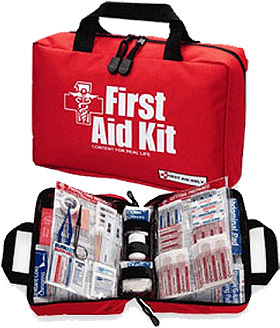 First aid kits should be checked on a regular basis to ensure that the items and dates have not expired. Keeping a list of all items in an easily accessible pocket can help save time while organizing a kit before taking a trip. Also, taking the time to pack any necessary medical information people in a party might have for a first responder to be able to read in case of an emergency might be helpful if that person becomes unable to relay the information themselves. In addition having the location of the nearest poison control center or hotline available in case of a snake or scorpion bite might also be something to consider taking along. Any extra prescription medications someone might need in case they lose or can't reach their regular supply before they need it. Aspirin and Ibuprofen. Ibuprofen works well to reduce fever, swelling, and inflammation from injuries or sickness. Calamine lotion to treat insect bites, poison ivy, or other types of skin irritations. Emergency ID collar and leash. Hand sanitizer to help eliminate the possibility of transferring bacteria or other materials. Tweezers to remove thorns, sticks, or splinters that could get stuck in an animal's foot or ears. Mild dishwashing liquid to clean skin in case of contact with an irritant. Ear cleaning solution in case of an infection, bite, or sticker. Self-cling bandages that do not stick to fur. Thermometer to check the pets temperature.